Business leaders in Alpharetta, Roswell, Johns Creek and all through North Fulton have placed their trust in BIS Benefits for employee benefits and group health insurance. Based in Alpharetta, BIS Benefits serves all of North Fulton County with the Best In Service employee benefits and insurance. What Cities Make Up North Fulton? North Fulton is the northern most section of Fulton County, Georgia and includes the cities of Alpharetta, Johns Creek, Milton, Mountain Park, Roswell, and Sandy Springs. Not only do you find great schools, economic vitality, nationally known churches and a rich cultural scene in North Fulton, but you also find one of metro Atlanta’s leading business communities. BIS Benefits is proud to be a part of the growing community with many of our 350+ clients anchored right here in our own backyard of Alpharetta, Roswell and North Fulton. 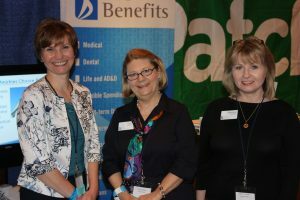 BIS Benefits employees at the North Fulton Business Expo. BIS Benefits was founded in Roswell in 1997 by Johns Creek resident, Ray Bachman. Today our offices are located in Alpharetta, just off GA 400 at Mansell Road. Many of BIS employees are also residents of North Fulton. We are your neighbors. BIS Benefits is proud to be a part of the North Fulton community. If you, or your North Fulton business or non-profit, are looking for a reputable employee benefits broker with years of experience and creative cost-savings options for your medical insurance then give us a call today. We serve small businesses ranging in size from several hundred employees to just two employees. We would be delighted to help you. Browse our website to discover all we have to offer you and your organization. BIS Benefits is a proud member of the Greater North Fulton Chamber of Commerce and is an annual participant in the North Fulton Business Expo.